AMMONNEWS - Minister of Foreign Affairs and Expatriates, Ayman Safadi, on Wednesday met with US Special Presidential Envoy for the Global Coalition Against Daesh terror group, Brett McGurk to discuss the latest developments on the global war on terrorism. Safadi and McGurk stressed the importance of the major victories that have been achieved by the Global Coalition against terrorist groups. he said that Jordan will remain an active partner in the international efforts to defeat terrorists. The two ministers also discussed the Syrian crisis, especially developments in southern Syria, and the international efforts aimed at reaching a political solution to the crisis. Safadi also pointed to the importance of increasing efforts to end the crisis through a political solution that is acceptable to the Syrian people, stops their suffering, preserves the unity of Syria and provides security and stability that allow the return of Syrian refugees to their homeland. 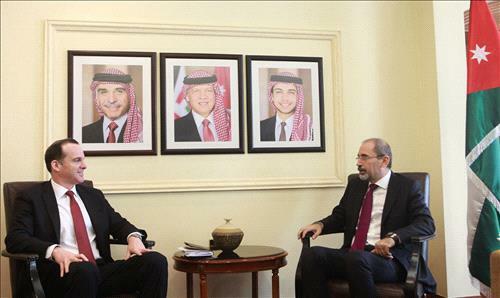 McGurk expressed his country's appreciation for Jordan's active role in the war on terrorism and its humanitarian role towards the Syrian refugees despite the economic challenges facing the Kingdom.